OroCRM’s email functionality helps businesses efficiently capture, organize and monitor email correspondence with all of their prospects and customers. Our open-source CRM seamlessly synchronizes with email clients, such as Outlook and Exchange, allowing users to save time by handling all email communications and calendar events without leaving OroCRM. All correspondence is saved and associated with the correct account, contact or case, allowing sales managers to avoid losing key emails or attachments and perform their jobs more effectively. In our 1.8.0 release, multiple improvements were made to our email capabilities that provide a seamless email experience directly from OroCRM. You can now specify which folders from your mailbox you want to synchronize with OroCRM, allowing you to sync only relevant conversations. For example, John is a sales manager using OroCRM to manage his customers across channels. He wants to sync all conversations with his leads, contacts and customers into OroCRM, but does not want to sync his internal communication with his sales team. 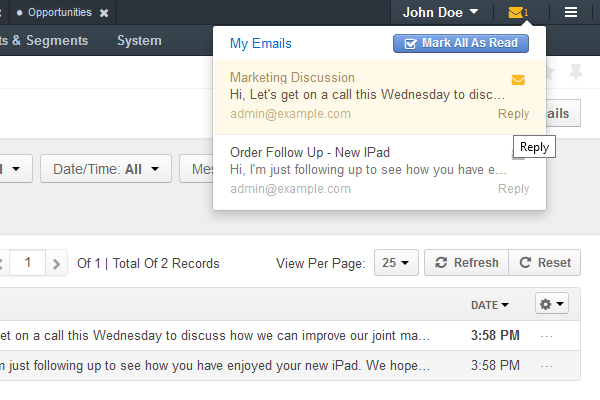 Now, John can select which folders are relevant and OroCRM will only sync those conversations. Our “Compose email” shortcut now allows you to compose an email from anywhere in OroCRM. 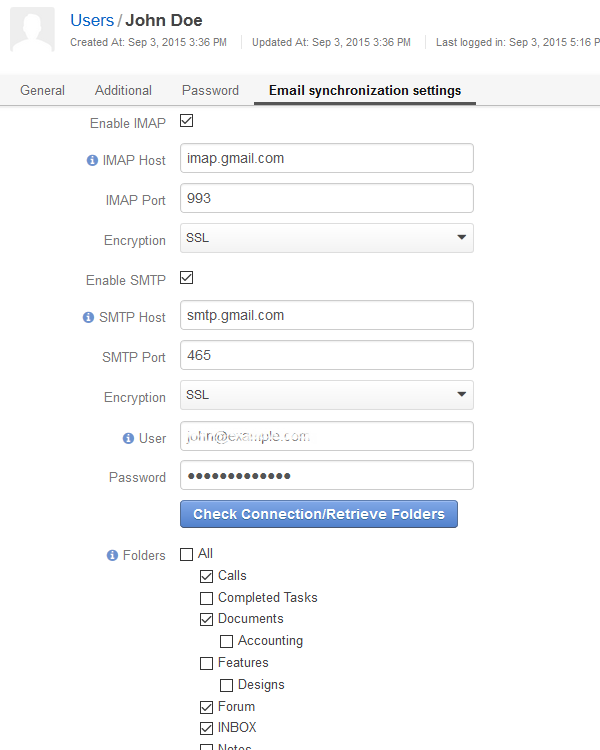 This saves users time by allowing them to compose and send new emails without having to leave the page they are on. Let’s use John again. John is hard at work and realizes he forgot to follow up with Wendy on their pricing conversation. John doesn’t want to leave the page he is working on, so he uses the “Compose email” shortcut to quickly respond to Wendy and get back to work. OroCRM can now quickly identify and notify you of unread correspondence. Placed in the top right corner, the indicator allows you to check and respond to new emails instantly without leaving the page. The read/unread status is synced with the IMAP server, meaning that if you have read an email in OroCRM, it will be marked as read in other email clients, such as Gmail. As you can see, John has received a new email about a marketing discussion. This email is not urgent and John is too busy to respond at the moment, so he will save it for later. If this email were urgent however, John could click on the reply button and respond right on the page he is on, allowing him to get back to work immediately after without the disruption of switching back and forth between pages. When composing an email, the recipient field now supports autocomplete, allowing you to input recipients quicker and more accurately. Autocomplete pulls from Contacts, Users, recently used email addresses and addresses relevant to a viewed record. John has to compose an email to a group of prospects. 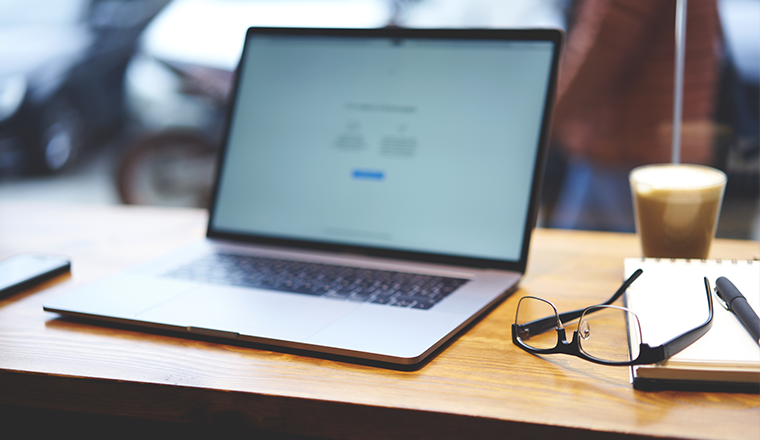 Instead of wasting time either typing or copying and pasting multiple email addresses, John can rely on autocomplete to fill in the relevant information, allowing him to be more productive. This action allows you to maintain email conversations with more than two participants in OroCRM. This tool is useful for sale managers engaging with multiple prospects or customers at a company, as they can include all relevant contacts and keep them in the loop. You can now add images to email bodies, templates and signatures, allowing you to illustrate your emails or add corporate style to them. This is great for John, who wants to include some images of his product to his prospects and his company logo to his signature for marketing and branding purposes. 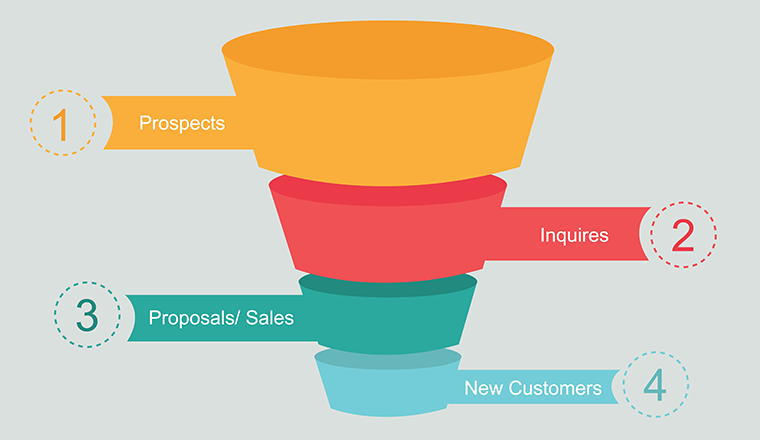 OroCRM’s email capabilities enable sales representatives to quickly and effectively reach out to their leads and contacts, qualify and nurture their prospects, and grow their customer base. To learn more about OroCRM, schedule a demo with one of our solution architects, or you can try OroCRM for yourself here.